Temporary & Electric Fencing Poly Fence & Reels Hardware Quick solution for repairing a torn fence tape. Easy connection of two tape ends up to 40mm. Cost Effective! Continuous Electrification! No Tools Required! Seal Caps lock and press wire to metal plate for max conductivity! Temporary & Electric Fencing Poly Fence & Reels Hardware Quick solution for repairing a torn wire up to 3mm - Stainless Steel. Cost Effective! Continuous Electrification! No Tools Required! Extremely long-lasting and impact resistant. Seal Caps lock and press wire to metal plate for max conductivity! Temporary & Electric Fencing Poly Fence & Reels Hardware Quick solution for repairing torn fence tape - Galvanized. Easy connection of two tape ends up to 12.5 mm. Cost Effective! Continuous Electrification! No Tools Required! Seal Caps lock and press wire to metal plate for max conductivity! 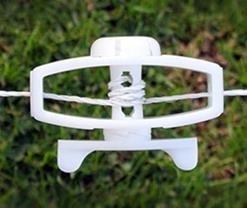 Temporary & Electric Fencing Poly Fence & Reels Hardware Quick solution for repairing a torn fence rope. Cost Effective! Continuous Electrification! No Tools Required! Ideal for connecting two rope ends up to 6mm in diameter. Seal Caps lock and press wire to metal plate for max conductivity!